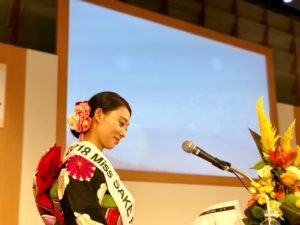 1 Masayo Hori, 2018 Miss SAKE runner-up joined the “2018 Good Work Establishing Fair” with Miss Asami Sudo, 2018 Miss SAKE, Aya Amelia Kodama, 2018 Miss SAKE runner-up. 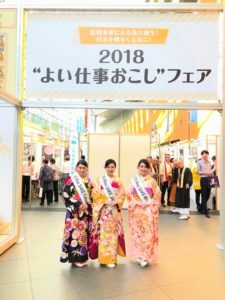 Masayo Hori, 2018 Miss SAKE runner-up joined the “2018 Good Work Establishing Fair” with Miss Asami Sudo, 2018 Miss SAKE, Aya Amelia Kodama, 2018 Miss SAKE runner-up. 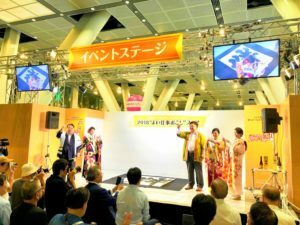 On September 19th, I joined the “2018 Good Work Establishing Fair” at the Tokyo International Forum with Miss Asami Sudo, 2018 Miss SAKE and Miss Aya Amelia Kodama, 2018 Miss SAKE runner-up. 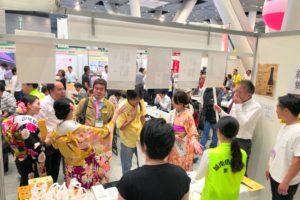 This fair is a business meeting held from 2012, after the Great East Japan Earthquake occurred. 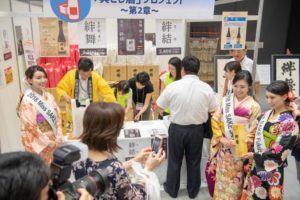 Last year, “special sake project” was planned as part of a “Good Work Establishing Fair” organized by Johnan Shinkin Bank. 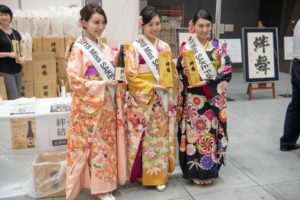 This year, as a new project they decided to brew sake from Japanese 47prefectures’ blended rice. 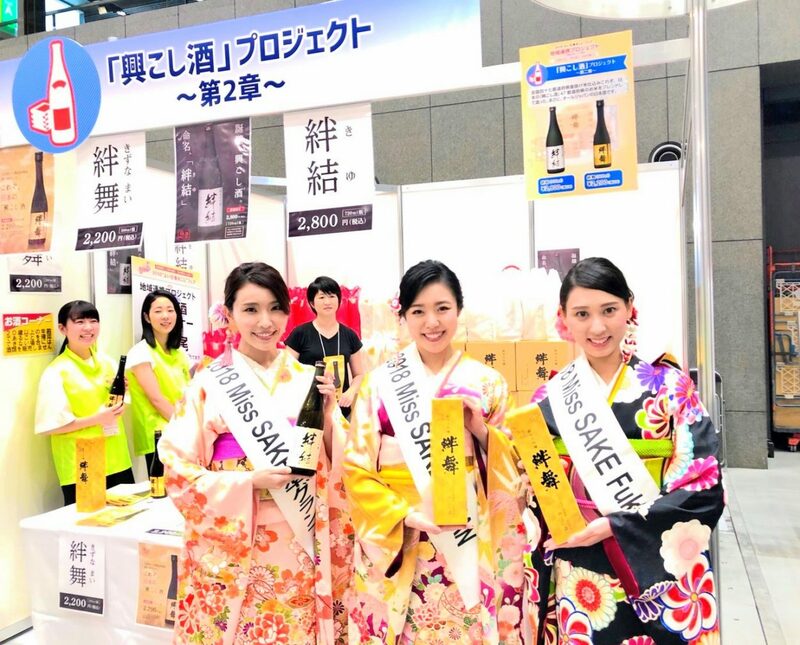 This sake was named“Kizuna-mai” expressing the strong bonds and the taste that makes you want to dance after drinking. 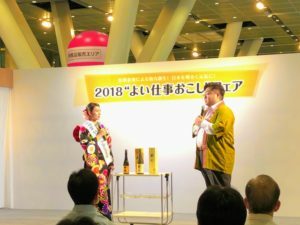 On the stage I introduced the special sake,“Kizuna-mai” as the main moderator and interviewed Mr. Suzuki, the chief brewer at Akebono sake brewery and Mr. Shimizu, the Mayor of Iwaki. 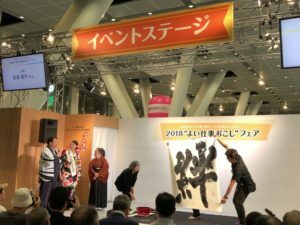 The most impressive thing was calligraphy performance by Miss. 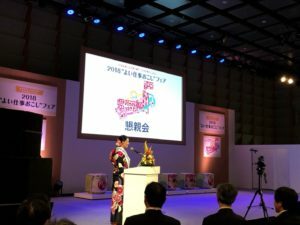 Kanazawa. 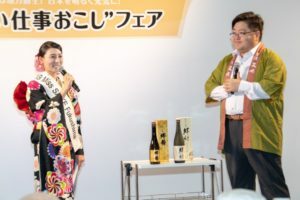 I appreciate that I was able to share the excitement with many people on this day. 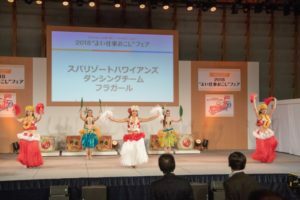 Our feelings are packed in “ki-yu” and “kizuna-mai”. 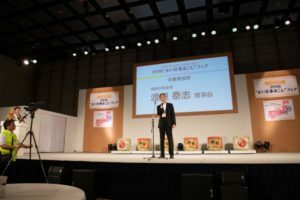 project in the disaster area. 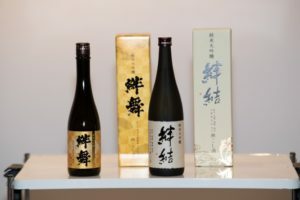 Please enjoy two types of special sake filled with energy. 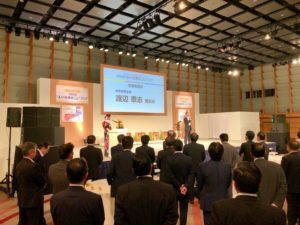 I would like to do my best to strengthen the bonds of Japanese 47 prefectures. 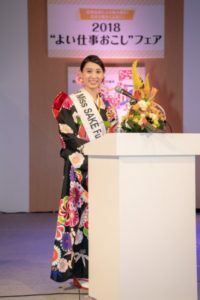 Masayo Horii, 2018 Miss SAKE runner up.